Infantry, cavalry, armor, and air power have come and go in importance as technology and tactics change, but sea power is the perennial king of interstate warfare. Even the Romans, famous for their undeniably supreme infantry forces, had to bootstrap a navy to use their legions to good effect against Carthage in the First Punic War. The modern nuclear-powered supercarrier, often the first asset deployed when an international crisis sparks, is the ultimate symbol of sea power and force projection today. First experimented with a century ago, new classes of aircraft carrier are still developed by the US Navy, providing worthy centerpieces for formidable Carrier Battle Groups (CVBGs). But before there was the carrier or the steel battleship, there was the ship-of-the-line, which provided the naval might for seafaring empires that spanned the globe. Sea power and force projection capabilities are exceptionally expensive luxuries today, as evidenced by the very short list of aircraft carriers in service. So how much did a ship-of-the-line cost in the past, and how does that compare to the modern cost of naval supremacy? Take the famous HMS Victory as a starting point. According to the Royal Navy’s HMS Victory website, the ship cost £63,176 at her launch in 1765. The United Kingdom’s GDP in 1765 was about £89.43 million, so the Victory accounted for about .07% of GDP* and 1.03% of defense spending**. The website describes this as the equivalent cost of building an aircraft carrier today. * The caveat, of course, is that ship construction costs are not incurred at the time of launch, nor does construction represent the total cost of acquiring, maintaining, and using sea power. For simplicity, we will compare all construction costs only and GDP at time of launch. ** The only figure I could find for defense spending in 1765 is £6.13 million on UKPublicSpending.co.uk, which sourced the data from B.R. Mitchell’s British Historical Statistics. Let’s take the USS Abraham Lincoln as an example of a modern aircraft carrier. Launched it 1988, the Nimitz-class carrier’s Wikipedia entry says it cost $4.726 billion in 2010 dollars, giving it an inflation-adjusted 1988 price of $2.598 billion according to the Westegg inflation calculator. According to IMF data, the US had a nominal GDP of $5.1 trillion in 1988, so the USS Abraham Lincoln accounted for about .05% of GDP that year. SIPRI data reports US nominal defense spending in 1988 was $293.09 billion, so the carrier would have accounted for .88% of defense spending if the cost had been all incurred that fiscal year. 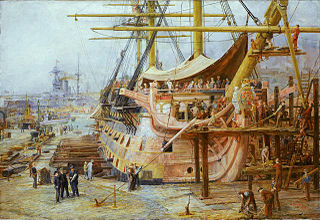 But the HMS Victory is a British ship, after all, so perhaps the Royal Navy was referring to a modern UK carrier. For that comparison, let’s use the Invincible-class of light aircraft carrier. The HMS Invincible cost £184.5 million in 1980, accounting for .08% of GDP and 1.38% of defense spending, while the HMS Ark Royal cost £332.9 million in 1985, at .09% of GDP and 1.74% of defense spending. 1 Based on reasonable extrapolation of 1671 GDP. Earliest GDP figure available is for 1692. 2 Unlike the others, this is a screw-driven ship. 3 When faced with differing estimates by renowned naval historians, I went with the one who teaches at my alma mater. Go King’s! If you notice my figures are off or math is bad, please drop a comment so I can fix it.